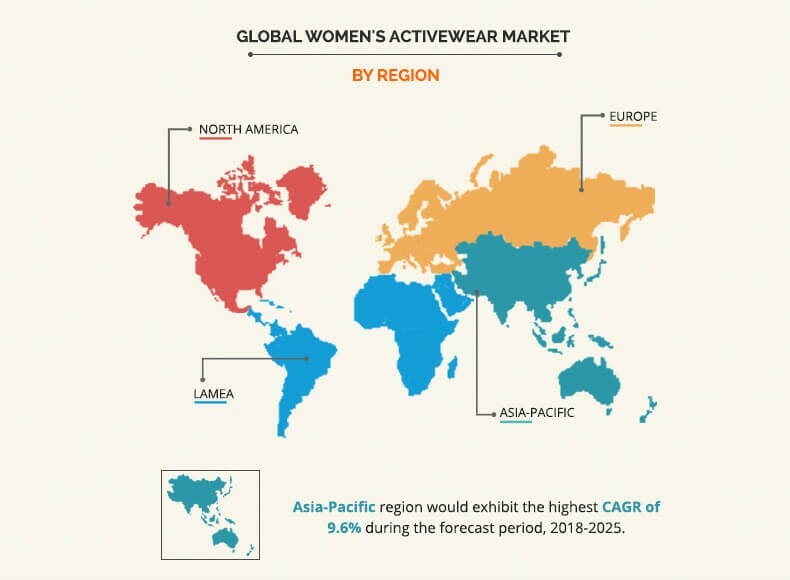 The global women's activewear market was valued at $119,078 million in 2017, and is expected to reach $216,868 million by 2025, registering a CAGR of 7.7% from 2018 to 2025. Activewear is a utility clothing for athletes engaged in sports and fitness activities. It helps enhance the performance of athletes, owing to its various advantages such as enhanced grip, wicking function, and bi-stretchable characteristics. 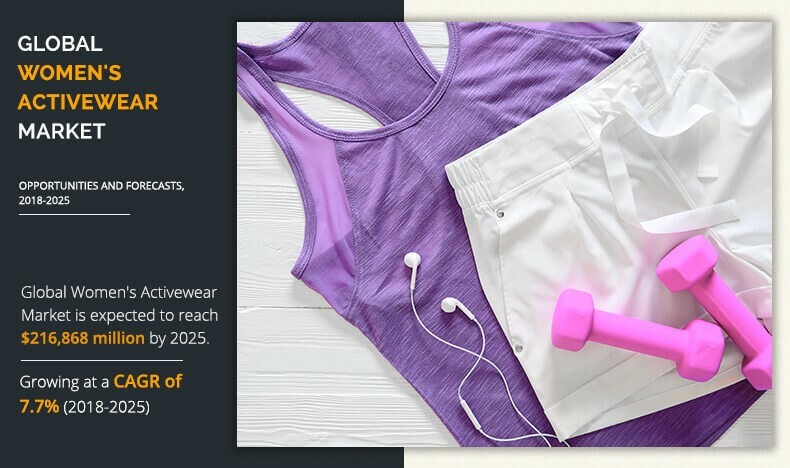 Extensive and unique advantages offered by activewear such as breathability, quick drying, static resistance, thermal resistance, and chemical resistance majorly drive the growth of the global women's activewear market. In addition, rise in health consciousness among consumers and increase in sports & fitness enthusiasm among female consumers boost the demand for women's activewear. Moreover, rise in participation of female consumers in sports activities fuels the sales of activewear, which positively impacts the market growth. For instance, increase in participation of female consumers in walking for fitness leads to surge in sales of sport shoes and activewear shorts & t-shirts. Moreover, holistic approach of female consumers toward athleisure wear positively impacts the growth of the overall market. Furthermore, increase in fitness and sports consciousness among young generation and upsurge in disposable income are some of the notable factors that support the market growth. However, volatile cost of raw materials and high cost of designing result in excessive cost of the final product, thereby declining sales of activewear among price-sensitive consumers. Similarly, availability of counterfeit brands causes inconvenience & safety issues for consumers, which adversely impact the market growth. On the contrary, growth in number of promotional activities is anticipated to create product & brand awareness, which accelerates the market growth. In addition, initiatives by various organizations such as rise in number of activewear-related campaigns and programs are presumed to expand the consumer base. Moreover, development of green textile and its use in formulation of activewear are expected to attract green consumers, which is anticipated to provide lucrative opportunities for the market expansion. Women’s activewear has witnessed widespread adoption among consumers, as they are casual and comfortable apparel suitable for purposes other than gym or practice/fitness sessions such as at work, shopping, and others. Increase in trend of activewear as regular or fashion wear boosts manufacturers to expand their product offerings in various categories, including top, bottom, outerwear, innerwear & swimwear, and others. Yoga pants and leggings are the flagship apparels of athleisure trend. The leading five brands for yoga pants & leggings are Victoria's Secret, Aeropostale, ALO, Forever 21, and Electric. Some of the key brands catering the premium price range in segment are The Upside, Beyond Yoga, lululemon, ALO, and Electric. 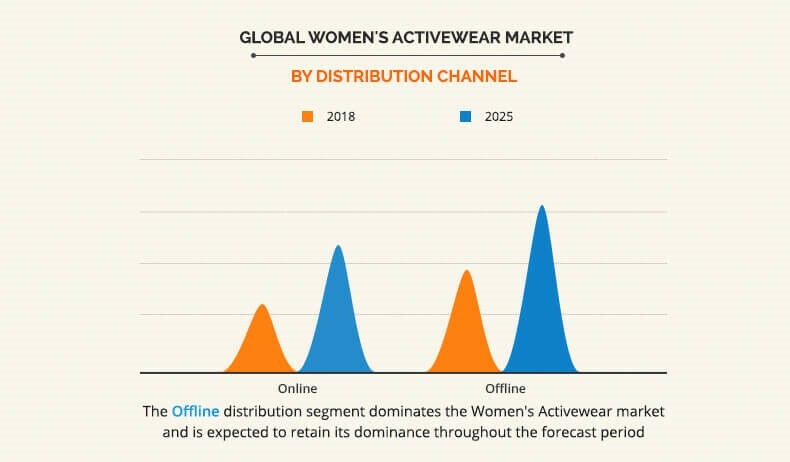 The women's activewear market by distribution channel is categorized into online and offline. Rise in popularity of activewear significantly supports expansion & opening of new outlets, which includes, hypermarket, specialized stores, mono brand stores, and others. Shift in purchasing habits and high penetration & acceptance of e-commerce boosts the growth of the online women's activewear market. 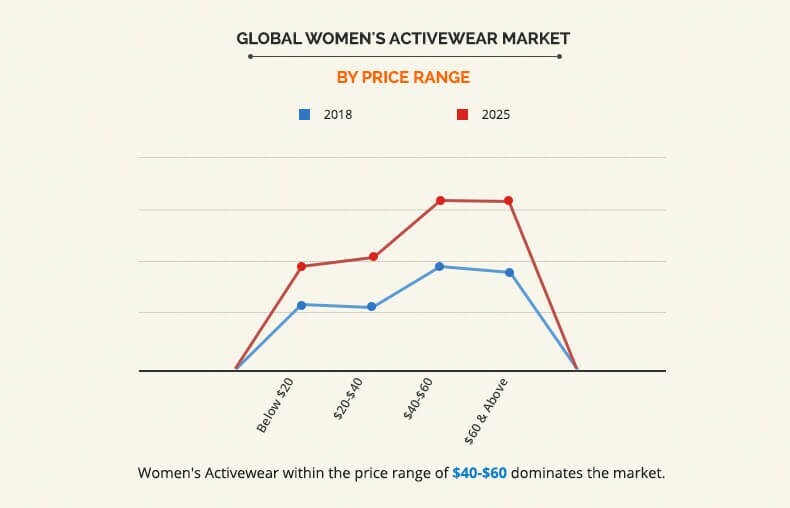 The women's activewear market by price range has been analyzed across four categories, which include below $20, $20&dash;$40, $40&dash;$60, and $60 & above. The market is dominated by products falling in $40&dash;$60 price range; however, the market for products within the price of $20&dash;$40 is anticipated to witness the highest growth rate during the forecast period. Crossovers between sportswear and leisurewear have led to the formulation of athleisure, which is widely adopted as a casual as well as a sportswear in the developed regions such as North America and Europe. Ongoing trend of pursuing a fit body and maintaining healthy lifestyle is one of the major factors that drive the growth of North America. The growth of the activewear market in Asia-Pacific is driven by upsurge in disposable income, change in lifestyles, and increase in urbanization in various countries of this region. In addition, the Indian customer base has become increasingly health conscious, which fuels the adoption of women's activewear. 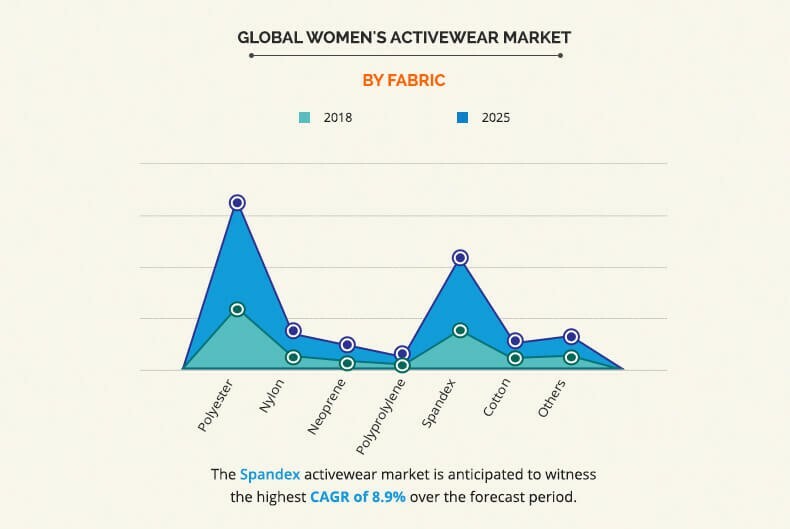 The major players operating in the women’s activewear market include Hanesbrands Inc., Mizuno Corporation, Adidas AG, ASICS Corporation, Columbia Sportswear Company, NIKE, Inc., V.F. Corporation, PUMA SE, Under Armour, Inc., and Gap, Inc. The other prominent players in the market include 2XU, Marmot, Patagonia, Mountain Hardwear, Vie Active, LLC, Mountain Khakis, Forever 21, Jordan, Gramicci, Filas, Prana, Aeropostale, Ralph Lauren, Victoria's Secret, Jockey, Beyond Yoga, Lycra, and Lululemon. The report provides an extensive analysis of the current & emerging market trends and opportunities in the global women’s activewear market. Activewear is a utility clothing used for physical activities such as sports and fitness. It is used for optimum performance supported with comfort in sports activities. In addition, it is widely accepted by fitness enthusiasts and sports enthusiasts due to its physical activity boosting features such as enhanced grip, wicking function, and adequate comfort. Moreover, bi-flexibility, easy drying, resistance to water & most chemicals, and other advantages fuel its adoption among consumers. Increase in disposable income, improved lifestyle, and customer consciousness toward health & fitness are expected to boost the women’s activewear industry during the forecast period. Furthermore, adoption of the athleisure wear as casual & office clothing and rise in number of customers participating in various physical activities fuel the growth of the women’s activewear industry. However, presence of counterfeit brands, high cost of designing, and volatile cost of raw material, are expected to restrain the market growth. The women's activewear market is anticipated to witness strong growth, owing to shift in trend toward athleisure wear and rise in sports & fitness awareness. In addition, increase in initiatives by government and private organizations to boost the participation of youth and old population fosters the market growth. 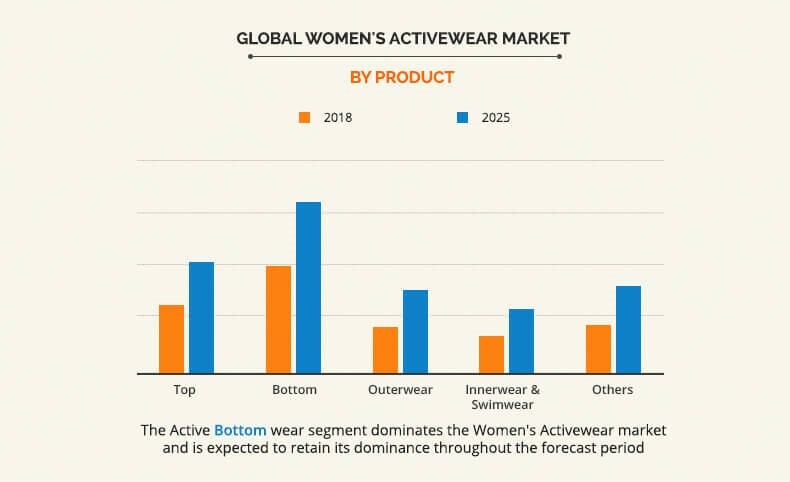 Moreover, rise in women empowerment campaigns and programs is anticipated to increase the female customer base for activewear market and other sports-related markets. Neoprene fabric offers advantages such as superior water resistance, adequate surface friction, and high flexibility, which enhance the performance of athletes, thereby fueling the demand for rash guard and other water-sports activewear.